How does Iris scanning works? Working principle of iris scanner or iris recognition is very simple.It uses a an HD camera and captures the unique features of your Iris and compares it with previously stored template. 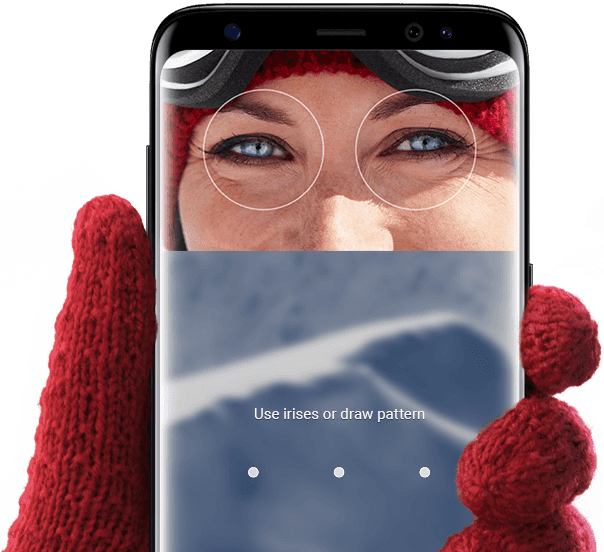 Iris scanner is becoming popular in modern smartphones.Picture shows iris scanner in Samsung Galaxy s8. Besides fingerprint and facial recognition, eye scanning is one of the widely used biometric identification. Iris recognition retinal scanning are the two types of eye recognition method.Iris recognition is a method of biometric identification that uses mathematical pattern-recognition techniques on images of one or both of the irises of an individual's eyes. complex Iris pattern of each person is unique, stable, and can be seen from some distance. Latest smartphones like Samsung Galaxy S8 comes with inbuilt Iris recognition for added security. 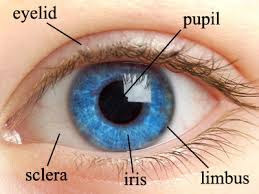 The iris is a thin, circular structure in the eye, responsible for controlling the size of the pupils and thus the amount of light reaching the retina. The color of the iris defines the eye color. 1.Image acquisition : To acquire image of iris with sufficient resolution .Image acquisition is done by either a digital camera or NIR(Near Infrared) camera. System will exclude eyelids, eyelashes, and specular reflections that often block parts of the iris. After localization image will only contain pixels of Iris. But images of Iris captured under different light intensity will not be the same. When eye is exposed to more light pupil will contract with the help of Iris and at low light pupil will be dilated. This problem is addressed by a normalization method known as rubber sheet model.This model was developed by Daugman ,a professor at Harvard university. In simple words , this normalization procedure converts a circular shape (Iris) image into rectangular shape. Technically speaking a mathematical tansform is applied on the image to transform it from polar coordinates to Cartesian coordinates. 3.Pattern matching: The Iris pattern derived from this process is compared with previously stored template. The iris of the eye has been described as the ideal part of the human body for biometric identification for several reasons.It has got many advantages over other biometric recognition like fingerprint matching, retina scanning, vein recognition etc.. It is an internal organ that is well protected against damage and wear by a highly transparent and sensitive membrane (the cornea). This distinguishes it from fingerprints, which can be difficult to recognize after years of certain types of manual labor. Many commercial iris scanners can be easily fooled by a high quality image of an iris or face in place of the real thing. Modern cataract surgery can cause change iris texture in such a way that iris pattern recognition is no longer feasible or the probability of falsely rejected subjects is increased. Iris and retinal scanning are known as “ocular-based” identification technologies, meaning they rely on unique physiological characteristics of the eye to identify an individual. In retina scanner a infrared beam is projected into the eyes and reflected beam is used to construct the structure of retina.Unlike retina scanning, iris recognition uses camera technology with subtle infrared illumination to acquire images of the detail-rich, intricate structures of the iris.In retina scanning device need to be very close to the eyes.But ,since iris is visible outside the body camera need to placed at a distance up to 10 inches.